An old bookstore in Kolkata’s College Street stocks some rare, out of print gems from the USSR. A few kilometres from Gorky Sadan is Manisha Granthalay, tucked away in a narrow bylane off College Street. You have to weave a zigzag trail through the lanes of College Street, around laden carts, stacks of books, scooters, and a multitude of people, to get there. It takes a bit of time if you do not know where exactly it is — for one thing, very few people seem to know about this throwback to the communist era with its wooden signage and dusty wall-shelves heaving with books. The books — literature, science, children’s lit — are all by writers from Soviet Russia. They look a bit the worse for wear because they have been here for more than 25 years! They are the remains of the last batch that arrived from Raduga Publishers in Moscow after Soviet Russia was dismantled in 1991. The bookshop had been launched on May 18, 1964, by the Communist Party of India. Prominent Bengali poet, writer, academic and art critic Bishnu Dey gave the store its name. The logo was designed by Satyajit Ray. And Jamini Roy gifted a painting, which still hangs on a wall. 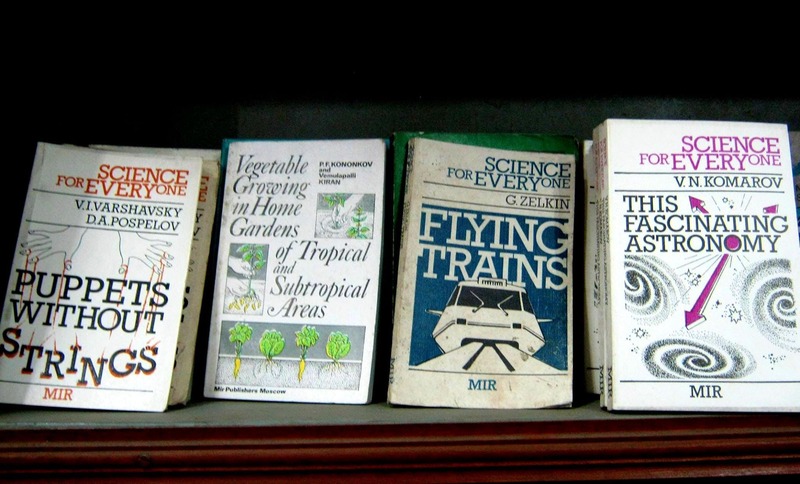 There are magazines and books on science, agriculture, industrial production, sports, and literature. The children’s section is somewhat depleted now, but still makes for a very interesting collection. At an asking price of mostly INR 20-30, the books are a steal.